A delightful, sunny venue with a superb circuit of problems. Garreg yr Ogef consists of a series of small escarpments lined up on the hillside above the eastern shore of Llyn Trawsfynydd. 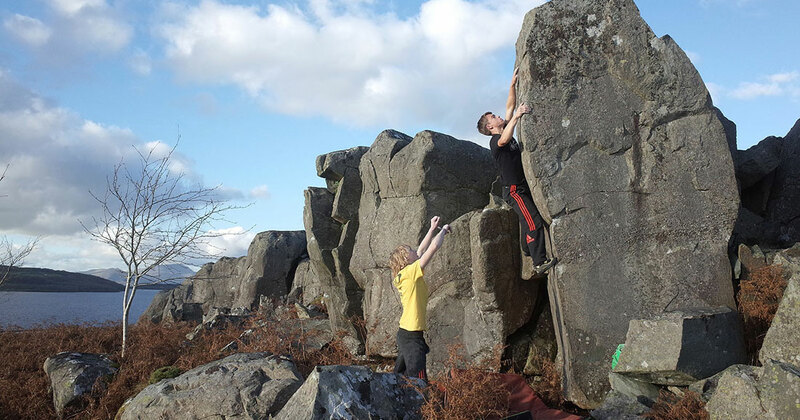 The rock is Rhinog gritstone – a fine grained version of its Pennine cousin. It is mostly of excellent quality but the occasional hollow/snappy patina will be encountered. The landings are quite rocky on the upper tier, but friendlier on the Undercut Wall area down by the lakeside. Conditions: The crag is southwest facing and as such catches any sunshine that is going. It is also fairly exposed so catches the wind too. The rock is very quick drying, although some of the lichen covered patches can remain slippy after rain – this tends to be more of an issue on the rocky landings than the problems themselves, which are mostly very clean. The sunny aspect is a blessing in winter, but can make it too hot during the summer months. Approach: From the small church in the centre of Trawsfynydd a public footpath leads off rightwards and around the houses, before crossing a field and popping out on the open hillside above the lake. To reach the main bouldering area bear leftwards for 150m or so, keeping fairly close to the boundary wall of the fields at the back of the village, and hopefully popping out at the southern end of an attractive escarpment marked by the distinctive pillar of Blood Scream. On first acquaintance the different escarpments can seem confusing but the layout soon becomes obvious once you’ve made a few exploratory forays – if in doubt check out the next escarpment line. The problems are described left-to-right, so start by walking to the left end of the escarpment. Here you will find a neat little wall which provides a good place to start a session. The left hand groove feature – tricky moves lead to a handy jug; yard up from this to top out. A fine problem with lots of helpful holds outside of the crack, should you need them. 10m to the right is an obvious undercut line. From a sit down start follow the crackline up around the bulge to a slopey top out. 8m farther right again is an diagonal ramp feature. Start sitting low on the right and move up left to follow the rising ramp line. 10m farther right an eye-catching crack is seen. A good problem moving up past a text book jam in the crack – shame about the landing. 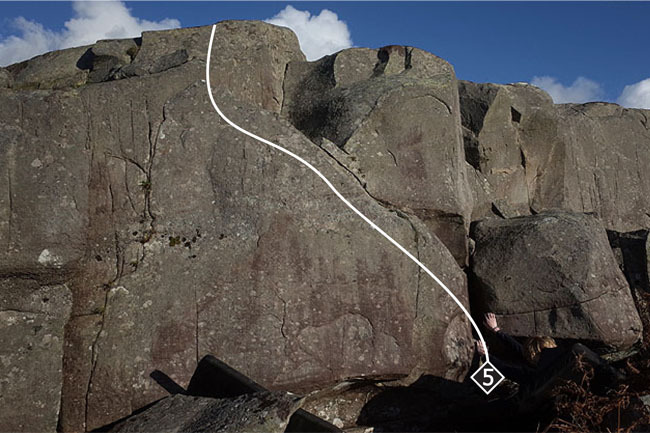 The curving undercut flake feature marks the line of this problem; take care with the landing. 10m farther right is the final section of the escarpment – this area hosts some of the best problems on the crag. The corner feature provides an absorbing problem. The undulating wall right of Problem 9 is as good as it looks. It goes from standing at 5C but the sit down start is tougher: start hands matched on undercuts beneath low overlap. Climb up past a mini ramp feature. The kinked crack line is friendly and accommodating. The striking arête provides the classic test piece of the crag. Climb it on its left side and save some juice (and bravery) for the slopey belly flop at the top. In the bay behind the Blood Scream pillar there is another good wall and arête. A steady line leading up the slight groove feature and past the left side of the sloping shelf. 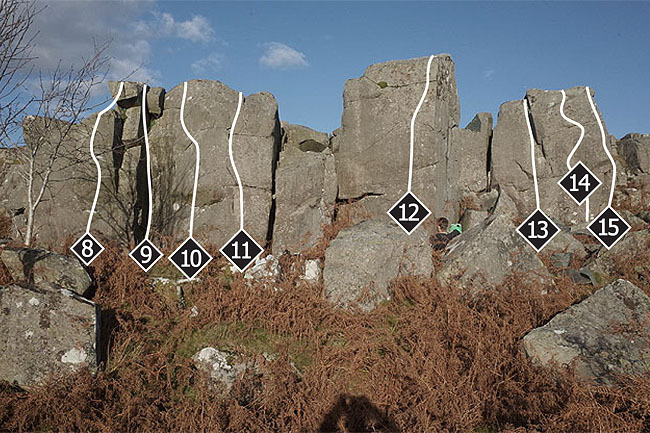 A tricky sit down start eliminate using the sloping edge of the groove on Problem 13 and any face holds you can find, but not the right arête. The right arête, taken on its left side, is a fine problem. Down close to the lakeside, approximately 80m from the farmhouse is an attractive wall, undercut at its base by a low roof. The broken groove feature at the left side of the wall is an entertaining romp. It is possible to force a 6A eliminate up the wall between the two cracks. 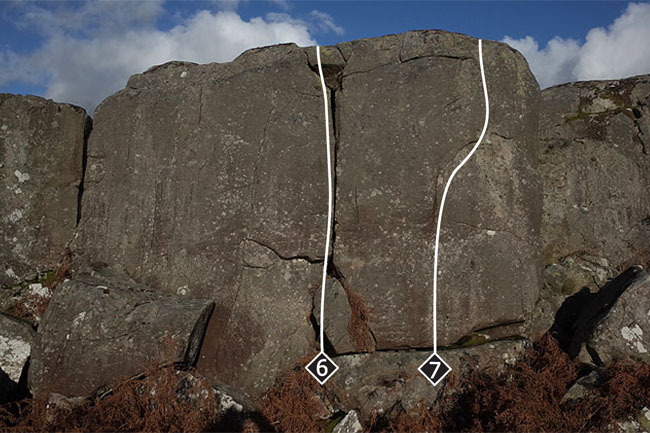 The wall is split in the middle by a central crack line – this is reasonable from standing but much more stubborn and awkward if taken from sitting (6A). Much better is the 6B link into Dafydd’s Groove. The small, shallow groove feature on the wall right of the central crack is excellent from a standing start. 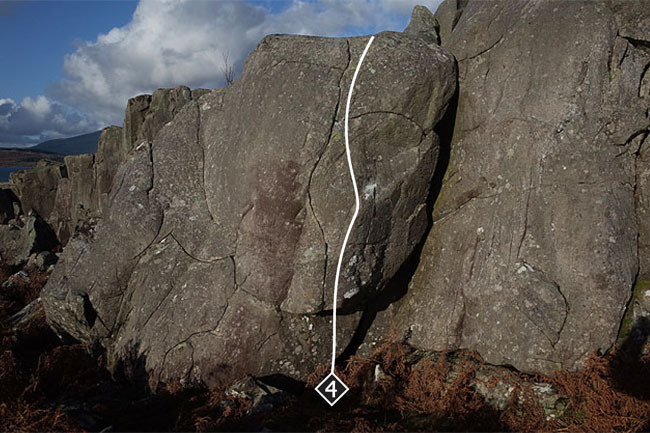 The equally fine 7A sit down start uses a choice of undercuts below the lip or side pulls above (or indeed, a combination of both) – lurch up to the slopey break and then make a hard transition into the groove feature. 7m to the right is another wall, undercut at its left side. A short and steady line. Up to the right is a roof crack with a bad landing. The last problems can be found on the block just to the right. Start on the right hand side of the block with hands on the high ledge – fire up left and finish direct. 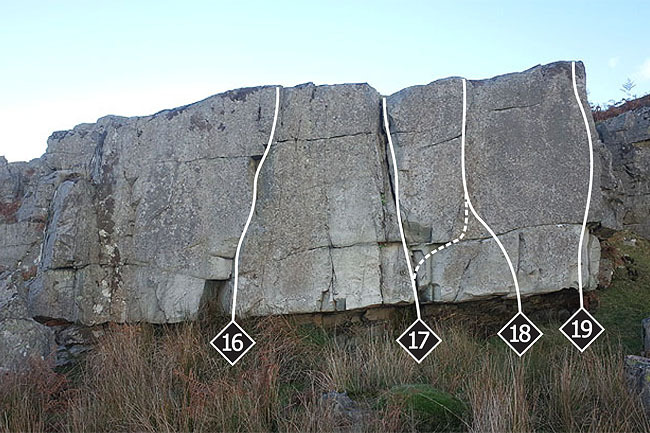 Above the Undercut Wall level there are numerous minor problems on an assortment of blocks, the best is Scaramanga 5C, sit down start line up a steep groove on the right hand side of the biggest and steepest block. There is also a 6B+ sit down start line which goes left and straight through the steepest part of the block. Back up at the northern end of the main escarpments is a higher section which has some recorded routes. There are a couple of highball lines here which will interest brave types. 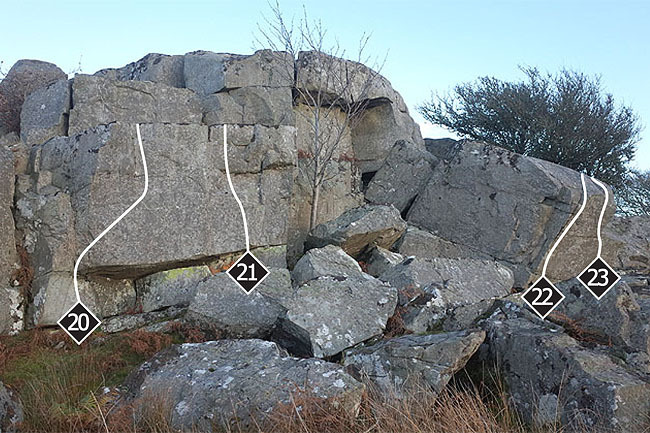 An obvious roof feature and an arête just about qualify as boulder problems, but both require a steady approach on the easier but very high finishes. There are also a few worthwhile problems on a low wall to the right and around the back of the highest part of the escarpment. 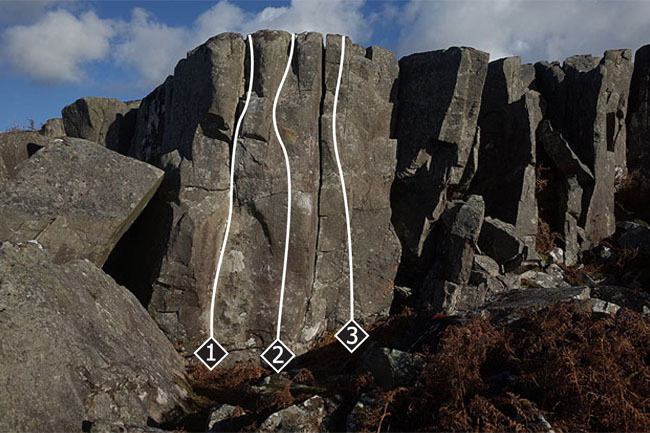 The best line is Ermintrude 5C, which takes the obvious arête on its left side to a difficult top out.